Soon after I turned five my family bought a home close to the beach. The fact that now, in my 70s, I take this experience for granted may be a confession of a lifelong hubris: I was born to live by the beach. 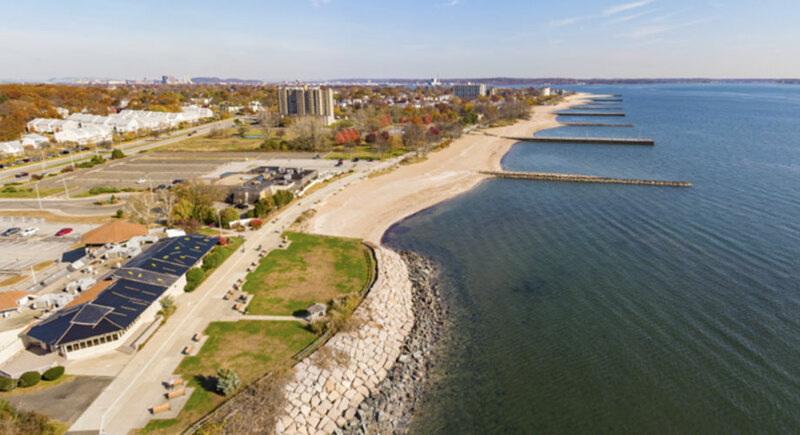 There were three beaches in my boyhood town of West Haven, Connecticut that were especially significant to me. Oyster River Beach was the closest to our modest home, purchased by my parents in 1952 with its mortgage guaranteed by the WWII GI Bill. The beach was about a half mile away from our house. In that era of free-range parenting, I could ride my bike down the hill and be there in five minutes. Savin Rock was farther away, but still less than three miles. Its beach, during the 1950s, was not the main attraction. The Savin Rock Amusement Park, a major tourist draw since its 1870s beginnings, was the ticket. 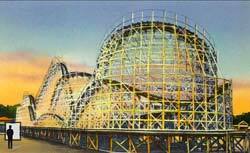 As a child, it was where I would be taken to enjoy the rides as a special treat when I brought home a good report card. Which was often, because…nerd. 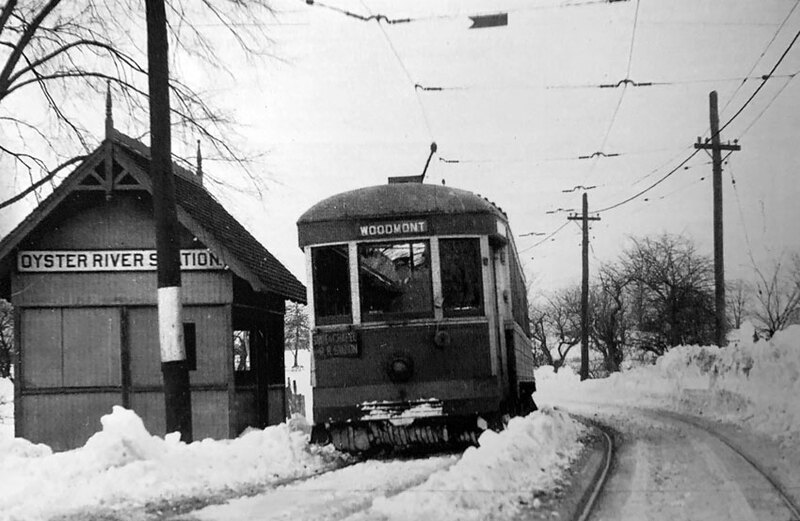 The third beach was not in West Haven, but in the nearby village of Woodmont. Anchor Beach, a postcard-perfect semicircle hugged by two rocky arms, was the beach of my teenage years, where I would nose my boat up onto the sand and attempt to befriend the natives. Nearby Merwin Beach was the site of my earliest memory in life, shown at the top of this page. Each of these beaches comes with a story. Click and drag to explore Oyster River Beach. Click the red target to enter the tidal marshland area. For the Google Cardboard version, touch here. Oyster River was not a beach favored by most of the folks in West Haven, as its sandy area above the high-water mark was narrow, and often blanketed with a flotsam of seaweed. But the shallow bay made for a prodigious tidal reach, with the waves perhaps a thousand feet away at the ebb tide. When the sea retreated every 12 hours a dynamic topography of tidepools and rocks was revealed, punctuated with shoals of mussels and oysters. Locals walked out with their pails and pitchforks to dig for littleneck clams under the sand. 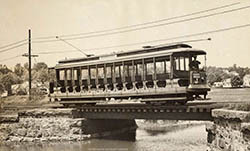 Trolley c. 1945 crossing the Oyster River. My love of the world under the waves began right here, where my first snorkel experience was in the cold and murky green waters of Long Island Sound, several decades before my diving expectations changed when I took a job in San Juan. My first salt-water aquarium, a ten-gallon tank my parents tolerated in the den, was populated with shiners, oysters, sandworms, and the occasional pipefish I caught in my net. The beach inherited its name from the Oyster River, the tidal flow that twice each day drains and then refreshes the large marshland down the hill from our home, which is indicated in the VR. When I was young my parents called it the “swamp,” a term likely designed to make it less alluring to a boy. They hinted at the danger of quicksand. The place evolved in subsequent decades into a “marsh,” and then a “wetland;” today it’s known as a “bird sanctuary.” Same place. A few years ago, my wife and I took our kayaks up into the Oyster River, timing our adventure to coincide with the tidal shift. To my surprise we drifted by the foundations of a long-abandoned trolley bridge, not far from the Oyster River trolley station. When I visited my mom in Connecticut in the autumn of 2018 I flew my drone into the marsh, in an effort to photograph the same spot. You can find the remnants of the trolley bridge in the virtual reality environment above, linked from the VR scene at the mouth of Oyster River. 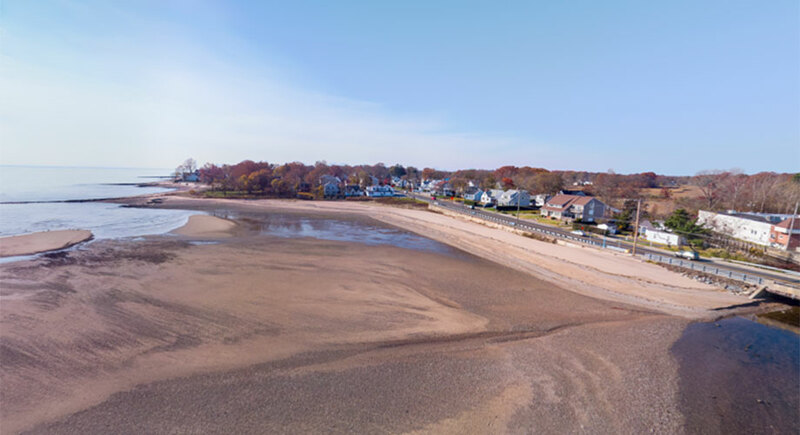 There is another West Haven beach which deserves a mention here, even though it’s not visible in any of the VRs. South Street beach was where my mom would take me and my siblings to the shore nearly every fine summer day as we were growing up. This was a “manufactured” beach, as it was just a rocky shoreline until the city, in the mid-1950s, made a destination beach out of it by vacuuming up sand from offshore. My mom and her friends played mahjong under a beach umbrella while we kids cavorted in the sun and surf all afternoon. Sunscreen was not even a thing; we applied “sun tan oil” to deepen our tans, as this was before we knew that sunburns can lead to problems later in life. Ask my dermatologist. Click and drag to explore Savin Rock and its beaches. For the Google Cardboard version, touch here. 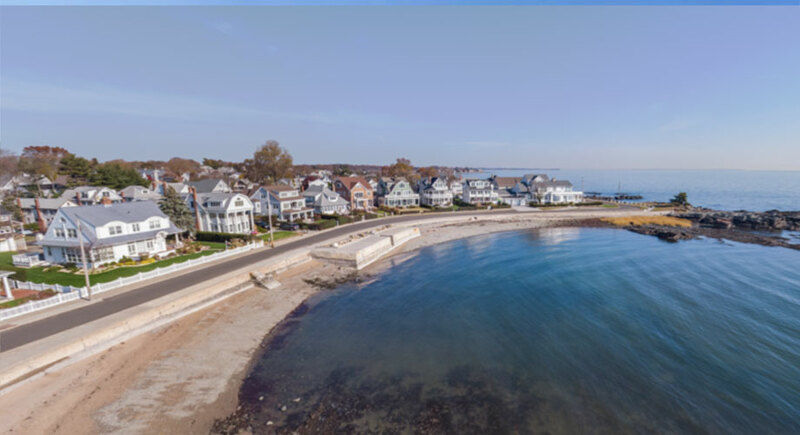 The aerial VR view was taken just off the boardwalk from THE Savin Rock, the geological feature that gave its name to the area. 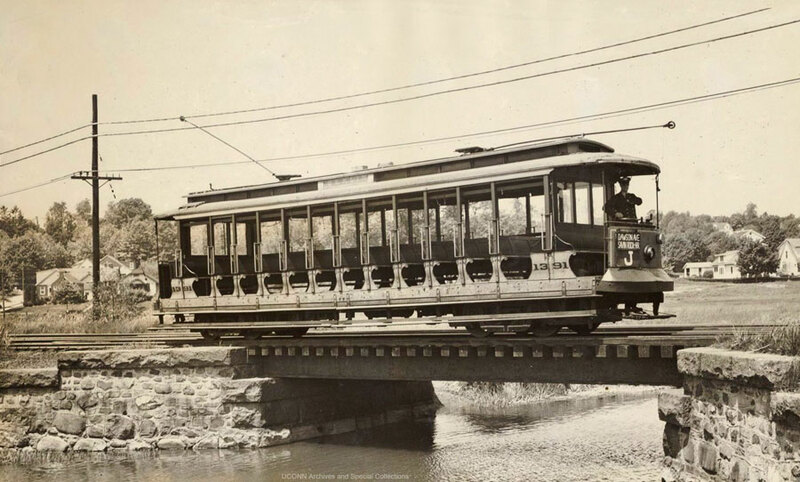 For a century, until its demolition in 1968, Savin Rock Amusement Park, and its White City (named for its then-novel electric lighting), were a tourism draw for Southern New England and beyond. My first memories of “The Rock” were of the kiddie rides, as may be seen here and here. Much of the 2 miles of sandy beach seen today, stretching NE to Sandy Point, would not have been visible from this vantage point in the 1950s. 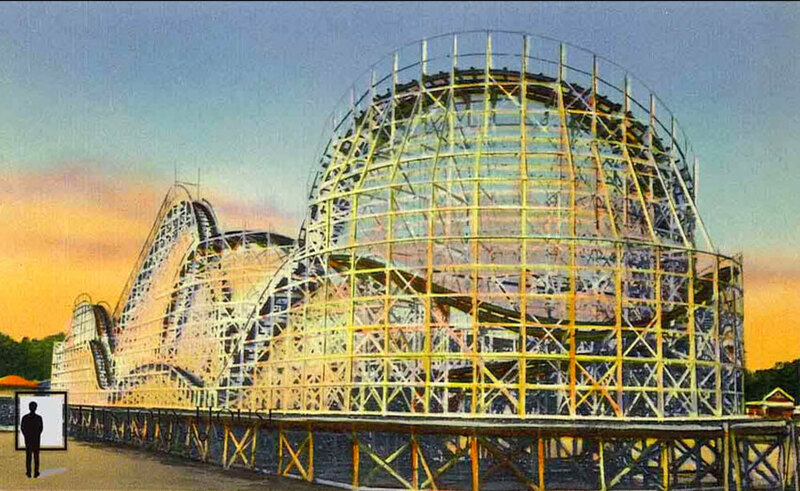 Parts of the shoreline to the east of the Savin Rock would have been covered with boardwalks and piers containing restaurants, fun houses, games of chance, and even a roller coaster (the Thunderbolt) jutting out into Long Island Sound. As I grew older the end-of-school-year visits to the amusement park became less enticing, in part due to the fact that as I was getting older, the Rock was entering terminal-stage decay and neglect, which culminated with the city’s condemnation notices, and the demolition of the remaining structures in 1968. When I turned 14 Savin Rock became the location of my first job, at the Carvel ice cream stand across the street from Jimmies, the restaurant right under the Rock. By that time the White City was already a rusting ghost town, and the few remaining attractions on Beach Street, sandwiched between scores of their shuttered neighbors, were facing the inevitable. I began to sense the poetry of decrepitude in my frequent walks around the hulks of the White City after my shift at Carvel, the feeling of loss that permeated the vine-covered rusty metal skeletons of amusement park rides where so much youthful exuberance had played out for a century. It was, for me, a location that was equal parts Rod Serling and Ray Bradbury. My response was to make a film, “The Flying Horse,” that dealt with these themes as only a sophomore could: with an abundance of enthusiasm and a dearth of nuance. But it was this exposure to the lost-civilization atmosphere of a funhouse ghost town that set the stage for my life-long fascination with remnants of the past, monuments and artifacts that reinforce our connections with earlier peoples by speaking to us across the ages. This experience of Savin Rock at its twilight gave birth to my 40-year project exploring Irish pre-history: Voices from the Dawn. But perhaps the Savin Rock moment most fixed in my memory occurred on a beach just to the west of the Rock, lying there on a blanket in the sand. It was the night of July 3rd, 1961, along with hundreds of others, I was staring up at the gunpower-sweetened sky, waiting for the bursts of color and percussion, and the anticipation of my first kiss. Click and drag to explore Anchor Beach. For the Google Cardboard version, touch here. When I was 16 I had one of the most traumatic experiences a boy of that age could have: I flunked my driving test. 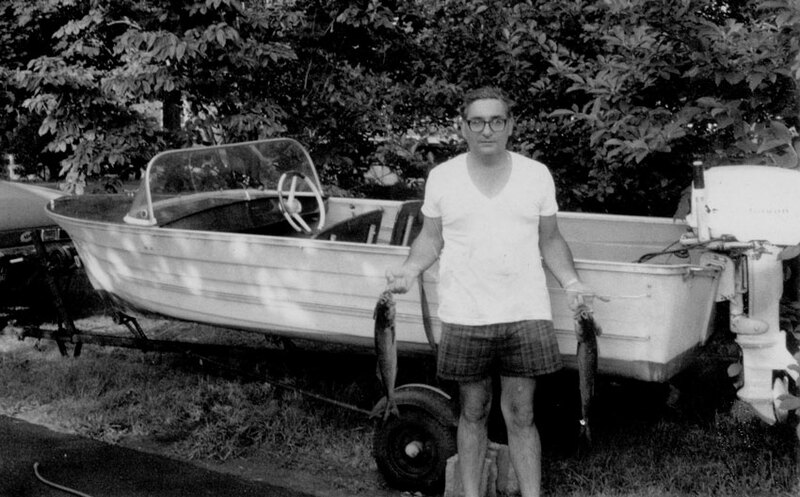 In an effort to assuage my teenage angst, my dad bought me a boat, a modest 12 ft clinker-built craft with a 10 HP outboard motor, operated from the stern. After I went away to college my parents bought themselves a boat with a trailer, a larger motor, and an actual steering wheel. And they joined the Surf Club. Go figure. I painted my boat a bright blue. We kept it anchored on a sandbar at Oyster River Beach, about 50 ft from the shore, so it was easy to begin a summer’s day on the water. If the tide was still out when I was ready to go, a friend and I would push the boat to the water. The boat after my boat. Dad warned me to keep my ocean excursions within the boundaries of Savin Rock to the east and Woodmont to the west, and to never go beyond the breakwaters (stone seawalls) some two and a half miles out in Long Island Sound. A few days later I was returning from my first trip beyond the breakwaters, which I then believed were beyond the 3-mile international border and therefore not subject to the jurisdiction of the United States, let alone my parents. 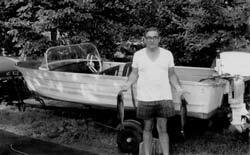 I landed the boat at Anchor Beach, where I knew some of the kids my age from school and from the Jewish community. As it turned out, not having my driver’s license, but instead having a boat, seemed to even out the social equation, perhaps even presenting me with a bit of an advantage. Just around the point was a stretch of seaside Woodmont known as Bagel Beach (aka Merwin Beach), where beginning in the 1920s middle-class Jewish folk from New York, Bridgeport, and New Haven would go to escape the heat and the grime of the city. It was there where I had my earliest memory, as a toddler sitting upright on the wet sand as my dad excavated the shape of a boat all around me. When he was done I was ready to sail my ship out to sea, convinced that I was born to live by the beach. Later in my life I lived by other beaches. But now the beach closest to my home has been at ebb tide for the past 10,000 years. I was born in New Haven and raised from the age of 6 months till I joined the Navy at age 18. I believe living by the sea and spending so.much time near the water is why the sea free me for 30 years serving my country. Thank you so.much for the memories. What a wonderfully written memory of this area! As a newcomer to West Haven (by way of California, my home state, followed by decades in Staten Island, then Brooklyn, then Westchester County, and finally Fairfield County), I thank you for your insights into what West Haven and Woodmont were like in the mid-to-late 20th century. My path has been the opposite of yours, beginning in Connecticut, and then making my way out West, with a long (26 year) stop in Illinois. What a marvelous piece of history you have documented, Howard. What a beautiful piece you wrote. I too remember the different beaches. I grew up on the beach too on Grove Place as you know and loved it. The neighborhood sure has changed quite a bit, but the beaches are still there. Do you remember when you fell through our attic on Grove Place? That was fun too. I think I peed myself laughing!! Your experiences match so many of my own! We too had a Savin Rock once a year visit on “promotion day”. Loved Bagel Beach (never once thought it might be a derogatory term) and Sloppy Joe’s. Surf Club too – with the teen lounge valued because parents were FORBIDDEN entry. That meant we could smoke (cigarettes) without worrying about getting caught. And of course South Street beach, watching the fireworks from the beach to celebrate the 4th of July. Nice memories, innocent days. The Anchor, Bagel Beach ( not an appropriate name) and The Surf Club….My beach memories from the early 60’s…..
A very interesting childhood account. It brought back memories as I also grew up in that area on Howard Street. WOW — great life /great stories ….